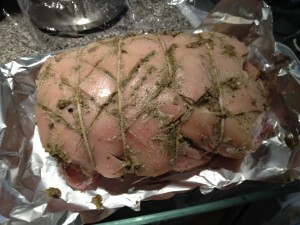 Porchetta is an Italian pork roast. It is traditionally done with a whole suckling pig, but most recipes will have you use a boneless pork shoulder (or a whole pork belly, if you are feeling extra indulgent). I called my friendly supermarket butcher and had him bone a 6 pound shoulder for me, leaving the skin on. 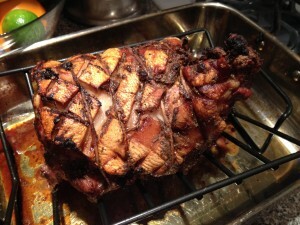 There are many variations of porchetta, so my recipe is an amalgamation of the dozen that I read. 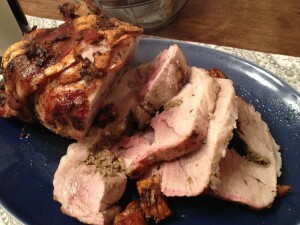 It is a flexible recipe, allowing you to pick and choose the herbs you like. I feel sage often overpowers a dish, so I elected to use garlic, rosemary, thyme, fennel seed, crushed red pepper, black pepper, salt, and olive oil. I put it all in a food processor and pulsed till I had a nice spreadable paste. I scored the skin with a cross hatch pattern and slathered the paste all over the meat, inside and out. I rolled and tied the meat up and allow it to air dry, uncovered, in the fridge overnight. I took the roast out of the fridge two hours before cooking, to allow it to come up to room temperature. There seems to be two schools of thought when it comes the cooking method: start it on high to brown and then drop the temperature to allow it to cook low and slow, or do the opposite - slow roast it and crank up the heat at the end to crisp up the skin. I chose the former, as I felt it gave my more control over the final temperature. I started the porchetta at 450 degrees for 40 minutes and then dropped the oven temperature to 300 till the roast had an internal temp of 135. 30 minutes of resting brought it up to 145 – perfectly succulent and juicy. The porchetta was delicious. My favorite part of the skin; we joked that the small squares of skin were like meat croutons. As delicious as it was, the roast was even better the next day when I made a porchetta sandwich with caramelized onions. Coincidentally, Steve was running a 5K race the next day. He normally carbo-loads with chicken, broccoli and ziti the night before a race, but he had a thick slab of porchetta instead. He ran the race in 20:28, beating his personal best by one second. Did the porchetta improve his time? I think so.